(SP-FS/Hamina) – Thick black smoke darkened the sky above the small town of Hamina in Eastern Finland this Tuesday morning. Alerted, the local fire brigade was quickly dispatched to the outskirts of the town. Sadly, too late for Tarmola, the home and meeting place of two local Groups of Suomen Partiolaiset-Finlands Scouter: Haminan Rantarillit and Haminan Päivänpojat. The wooden building and its installations (included sanitary and kitchen facilities) were an easy prey for the flames and destroyed completely. 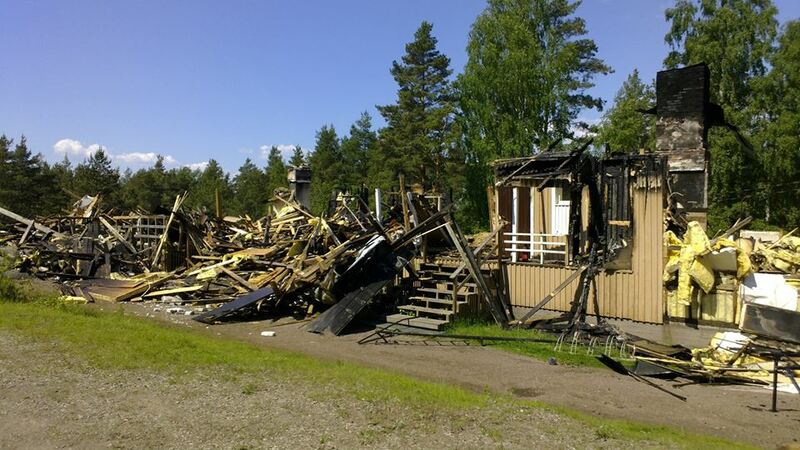 So was all the material stored in the house, such as chairs and tables, tents, ropes and tools, camping equipment, Scouting and Guiding literature, the Groups’ flags as well as souvenirs going back more than eighty years of history of Scouting and Guiding in Hamina. 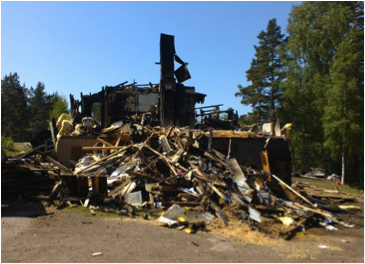 “It really is heartbreaking to see our Hall in ruins”, says Ulla Sivonen, treasurer of Hamina Rantarillit, when inspecting what is left of Tarmola on the following day, “It was the ideal meeting place for our Guides and Scouts, so close to the forest and hiking trails”. Members of the two Groups had fully renovated their Hall by themselves back in 2009. “Yes. It is true. 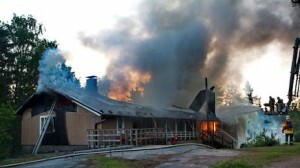 No one was injured or killed by this fire”, Ulla adds, “And of course we are grateful for that. But our two Groups had become so familiar with this place that it really is a huge shock. And the material and immaterial loss is great”. 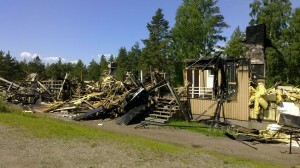 Apart from many memories shared by the Scouts and Guides of Hamina, only a few items were saved. Luckily, the Groups’ boats had already been put to sea for the beginning outdoor season, but the new sails went up in flames. As did the new mattresses bought a year ago and regularly used for overnight stays at Tarmola. The disaster has of course an impact on the programme run by the two Groups in the immediate future. “As much as possible”, confirms Ulla, “activities will go ahead as planned. And the summer camps will also take place.” With welcome help offered by neighbouring Groups in the Kymenlaakso Scout and Guide District: Haminan Päivänpojat will go on their planned archipelago tour, albeit with different vessels. And Haminan Rantarillit will pitch borrowed tents for their camp next month. Suomen Partiolaiset – Finlands Scouter (SP-FS, the National Scout Organisation in Finland), has launched a special campaign to help raise funds, which will enable the local Groups in Hamina to carry on their regular activities in the coming months. Other donations, such as handbooks or other Scouting and Guiding literature, are also collected and will be very useful when the indoor season will again begin in a few months. – Information about the solidarity campaign and how to make your donation is available on the website of Suomen Partiolaiset – Finlands Scouter. 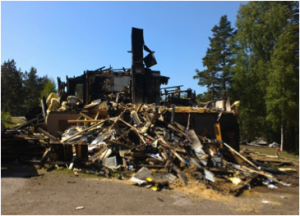 – The two local Groups in Hamina are present on the Internet as well (Haminan Rantarillit and Haminan Päivänpojat) and their – now destroyed – Hall has its own Facebook page.